MSNBC "counter-terrorism analyst" Malcolm Nance suggested Tuesday on Twitter that ISIS should carry out a "suicide bombing of a Trump property." 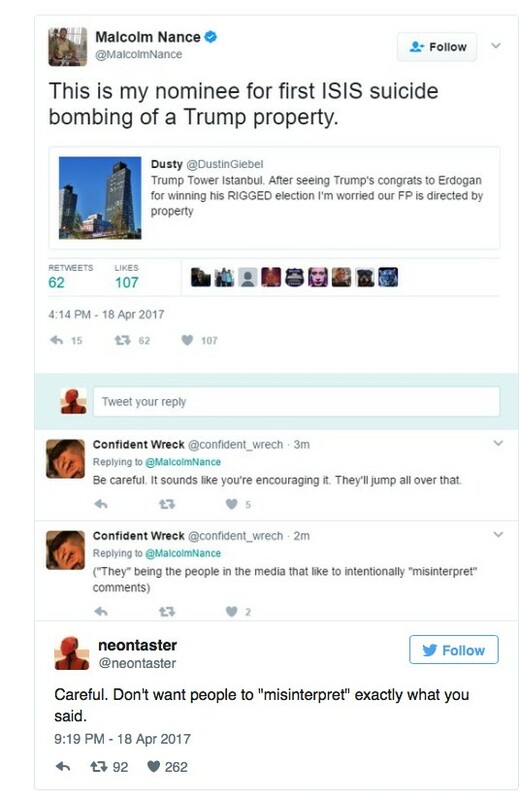 "This is my nominee for the first ISIS suicide bombing of a Trump property," he wrote, retweeting a picture of Trump Tower Istanbul. Nance later deleted the tweet without issuing an apology or providing an explanation. As Infowars highlights, Nance said last year that Trump was "the ISIS candidate" because he "inflames" Muslims by criticizing them. Nance last year suggested the Orlando gay nightclub massacre was the result of a "psycho-sexual problem" rather than ISIS inspired terrorism and the San Bernardino mass shooting was "a hybrid act of terrorism/workplace violence."